The following #writingtips apply to all stories, but especially short ones where every scene must be essential. Happy Short Story Month! When I plot a story, I tend to think in terms of action. This is probably due to my screenwriter training. In a screenplay all you have to work with is action and dialogue. And in an outline, where you don’t write dialogue, all you have is action. So naturally, when I outline, I follow the action – this takes place here, then the character does this, then the antagonist counters with this move, etc. This is a perfectly good way to plot a story, as I explained in this post: Outlining – Active Beats (aka “Show Don’t Tell”). However, a proper scene requires more than just action. Goal – what does the hero want? Obstacle – what is preventing the hero from getting what he wants? Conflict – who is opposing the hero’s goal? Change – how is the hero different by the end of the scene? For more details on these basics, check out this post: Outlining – From Sticky Notes to Proper Scenes. Got the basics down? Awesome! Now we have proper scenes, right? Despite having all this good stuff in a scene, it could still fall flat. Why? Because it might not be essential to your story. We need the No Filler Test! To take this test, you need a scene. We’ll use one of mine (from my outline) as an example. In response to the panicked call Taryn received from Kate in the previous scene, Taryn leaves her date mid-meal and gets in her car to go help Kate. Taryn pulls out and heads towards Kate’s house, then notices Mel’s car tailing her. Damn. If Mel finds out what they’re up to, they’re dead! Taryn has to get Mel off her tail before she can go help Kate. A car chase ensues through town until finally Taryn outsmarts Mel and leaves her in the dust. As you can see, this scene covers all the basics: it’s full of action (car chase! ), and there’s a goal (get to Kate), obstacle (Mel), conflict (Mel wants to find out what they’re up to and Taryn cannot let that happen), and change (from worried to triumphant when she loses Mel). As an added bonus, it’s fun because my protagonist gets to show off her mad driving skills! Third, nothing and no one is affected by this scene. In other words, what happens in this scene doesn’t reverberate throughout the story. Thank goodness I can rewrite and take this test again! Bottom line, passing the No Filler Test ensures every scene resonates and truly serves the story. Ever read a book where a whole bunch of stuff happens, but you’re still bored? I bet it was full of scenes that would fail this test. Unfortunately, writers are notorious for falling in love with scenes that don’t pass the No Filler Test, and we’ll give you all kinds of reasons why that scene is vital – it introduces a character, or it sets the tone, or it’s a logical progression, or it reveals information, etc. All those things may be true, but they’re not good enough reasons to keep a scene. It all comes down to change and consequences. (Doesn’t everything about storytelling?) Something in the scene must directly change/affect the plot and/or characters. If not, it’s filler. Cut it. But what about setting up character or revealing information? No problem; just combine scenes. Put the necessary details gleaned from the filler scene and insert them into another scene. Or move an important turning point into the filler scene to make it essential. Don’t settle for a scene that “kinda should be there”; make it absolutely indispensable! Do filler scenes plague your writing? How do you deal with filler? What do you think makes a scene essential? 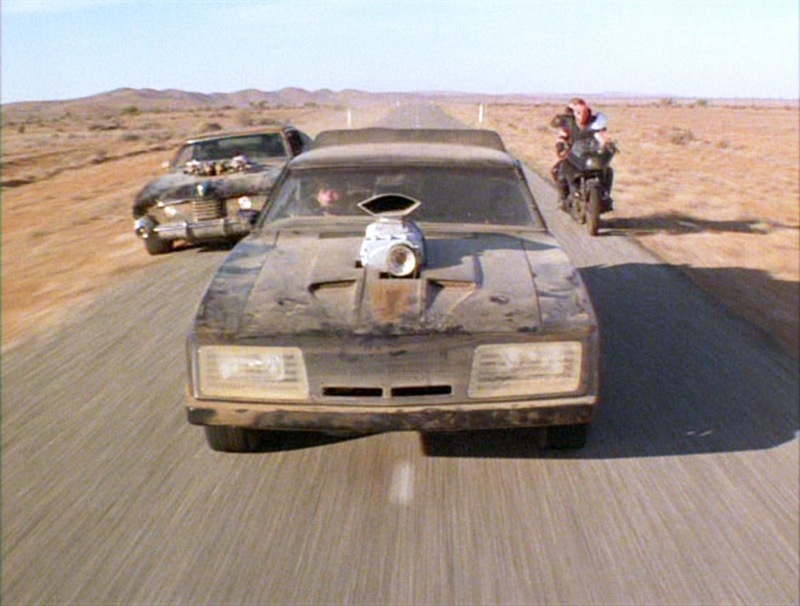 PS – I really need to see Mad Max 2 soon! Hi! I know you may not see this because it’s been a long time since the post was written, but I’m wondering if you have advice on how to ensure questions 2 and 3 are different. I find that if I think, “The [#2] protagonist is different by the end of this scene because she realizes ____ now! [#3] So she’s the one affected!” But there’s no different reasoning for #3 than for #2, if that makes sense. A super great guide! 🙂 I definitely need to run this test on a few scenes that I’ve been unsure what to do with. They just might be filler. Thanks, Kaitlin! Good luck with the rewrites! I remember when I was starting doing seriously with my writing (and we’re talking a long time ago… erh…) I read an interview with Ken Follett. He was asked what’s the secret of his success and he said that, when he writes a story, every 3 or 4 pages the story has to move. He said it isn’t necessary that something ‘happens’, but things have to move. I always remember that when I plot my scenes. I suppose he was saying the same thing you’re saying here. Yes, I think so. In simple terms: he calls it movement; I call it change. That’s a great test. At the moment I struggle with keeping my word count high enough (university writing turned my long rambles into short-and-to-the-point, which isn’t always best for writing. But adding a reason for those extra scenes to happen (small outcomes driving the plot forward–or backwards!) will really help me along. 🙂 Thanks! Hm. Okay. So what happens when you have information the reader needs (or a relationship you want the reader to see/understand) but you aren’t sure if anything changes beyond, say, two characters communicating information or discussing a problem? In the case of information, combine it with another scene that has action/change/etc. An information drop doesn’t warrant its own scene. In the case of the relationship, the change would likely be emotional. But something absolutely must change. Especially when characters are discussing a problem, they will come to a decision on what to do about the problem, right? That’s a change. Because of that decision, they end up in a different place emotionally than when the scene began. Or maybe they don’t come to a decision, but one of the characters has a reaction that changes things. In the story I worked on this weekend, I feel like things aren’t moving fast enough or that there’s no relevant change happening from scene to scene. So I’m not sure if anything’s changed using. Imani’s still conflicted/worried, but now she’s got practical worries on top of emotionally-driven ones. Is that enough of a change? Scene 2 presents her with a potential new opportunity, but she’s not sure she’d be allowed to go/accepted. The scene is mostly her listening to her friend’s family talk about their plans for an upcoming trip where she might get to meet someone who can teach her something she’s been interested in before but hadn’t had an opportunity to pursue. There’s not any external action, just an information drop and the protagonist switching from “I don’t know what to do…” to “I could do that…but…” I’m not sure things are changing or if they are it’s not at a fast enough pace. Hi Rose! Let me think on that after a good night’s rest. Today’s been a crazy meet-a-deadline day. Hope you got some rest, Heather! Scene 1 – I think giving the protagonist 3 things to think about constitutes a change. As long as those were things she wasn’t thinking about before, and as long as those things are integral to moving the plot forward. So it would be a change in perspective that influences the plot. Scene 2 – This scene sounds more like filler, unless the conversation she is listening to leads to a decision. What is your motivation for delaying her decision? Or, another way to look at it, how can you make this scene give your protagonist a more powerful push into action? Thanks, Heather. I did end up cutting scene two. Originally, the reason it was there was because I wanted to introduce the other characters and set up the plot, but I was able to use a shorter info drop in scene 1 and give her a more immediate goal without needing to bring in the other characters. I think the career issue will work better as part of a multi-story arc. But this post helps a lot. Those are great questions. It’s something I’m always struggling with/thinking about: how essential is this to the story. Luckily, I’m a minimalist writer, so I have a high setting for filtering out unnecessary stuff in my writing. Despite that, I still wonder if I’m not indulging myself sometimes. From now on, I am using those three questions. Also, sometimes fillers are the most fun to write. That’s when it’s the hardest to cut them out. I understand! Fillers are often the fun scenes, funny scenes, or nostalgic scenes, all of which we love! Hopefully this test helps you identify those scenes yet keep them by adding something essential. Good luck! Excellent advice, as usual, Heather! I’m almost afraid to put my scenes to the test. LOL But I will! Do it! I know it’s terrifying, but also so necessary. Great info. I’ll have to see about putting my stories to the test so I can figure out if I have scenes that need to go. Excellent! It’s a scary test, but so worth it in the end.